The UNI CIEP encourages research which may lead to improvements in the field of TESOL, education, international education, or other related fields of academic study. Follow the links below to see the current research by the UNI CIEP staff. To meet accreditation standards, IEPs must track and analyze in-depth the success of their students. This presentation will describe a systematic method to collect and analyze IEP student information and achievement data using spreadsheet formulas and tables. Some curricular changes based on these analyses will also be shared. This evaluation was done by Asih Asikin-Garmager as part of her Program Evaluation Practicum class at the University of Iowa under the supervision of Professor Donald Yarbrough. Asih is a doctoral candidate and former UNI CIEP instructor. This report provides valuable information and feedback. Beginning in the Fall 1 2014 term, Jaime Lyon and Emily Luttrell-Narigon, of the Reading Committee, were responsible for a few different tasks. The committee first began by choosing textbooks for the levels. The committee then implemented supplemental packets for Levels 4-6. Lastly, the committee reviewed and extended outcomes for all levels. To conclude, it was decided to continue using the Making Connections series in Levels 2-6 while Bridge would adopt Pathways: Foundations. In addition, new McGraw-Hill Create books were made for Reading 7. Also, Emily continued working on supplemental packets throughout the term. Finally, overviews and syllabi were created for Levels 2-6. Outcomes and materials for classes will continue to be reviewed to determine the proper alignment with the class outcomes. Starting in the Fall 1 2014 term, Tom Riedmiller was made responsible to head the Writing Rubric Committee with the assistance of Jeannie Kleinhans, Lucas Plouff, Lauren Rein, and Sara Penning. The committee was to develop a new Writing Placement rubric aligned to new 2013 Writing Student Learning Outcomes. The committee was also responsible for developing some updated writing prompts because the old ones were outdated. To conclude, the committee has successfully completed their assigned responsibilities. Lauren and Sara used their knowledge of statistics and assessment to assist Tom in creating the new rubric. Jeannie and Lucas have created new prompts that are updated and more user-friendly to students. These new developments will allow our program to continue to improve. This research project was conducted as part of a project to look into the effectiveness of the student-learner outcomes in the UNI CIEP. The research into these needs is two-fold. First, several university faculty members were contacted for an interview. Faculty members were sent a questionnaire before the interview in order to introduce some of the data that the researcher was seeking. During the interview, quantitative and qualitative data were gathered. In the second part of this research, syllabi were gathered from academic departments, mostly from the UNI Liberal Arts Core (LAC) curriculum. These syllabi were analyzed for reading, speaking, and writing assignments, as well as assessments, course descriptions, or other relevant facts. In 2012, Academic Support Specialists Jaime Lyon and Petra Maier researched videoconferencing technology for use in the UNI CIEP. Click here to view the Videoconferencing Technology Report. The following results are based on three studies: one for IEP/ESL instructors, one for program directors, and one for ESL students of intermediate English ability and above. Rather than deal with each survey individually, this presentation merges what we consider to be the most important data using the instructor survey, by far the largest of the three, as a framework. 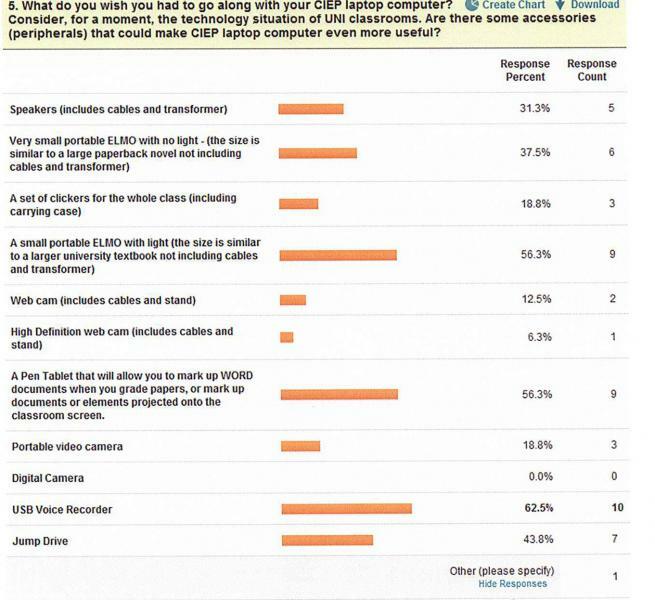 The data for the teacher and student surveys were gathered online during April, May, and early June, 2007. Click here to view the full report. Each week, students gather in the library with UNI CIEP Instructor Tim Thomas. This activity began in order to give UNI CIEP students a chance to practice reading English is a setting other than the classroom. Jaime Lyon and Tim Thomas have surveyed the students that participate in this activity. The purpose of the research was to identify the likes/dislikes of the library bridge program and if students found reading books once a week at the library helpful to acquiring reading skills and English vocabulary. There were 13 students who took the survey in Spring 2011. All the students taking the bridge level course were from Saudi Arabia: 9 male and 4 female students. Julie Zagor, a former Program Assistant for UNI CIEP, studied current research on pronunciation. To see her research literature overview and a sample lesson plan, click on the links below. An on-going project in the UNI CIEP includes updating rubrics for Writing classes. Listed below are samples of the current rubrics used in the UNI CIEP for midterm and final exams. The Grammar Instruction Survey was conducted in May 2011 by Petra Maier (Grammar Coordinator). 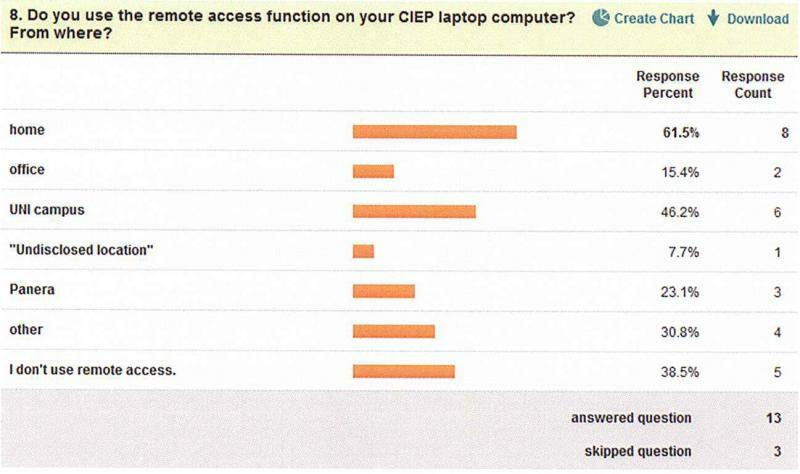 Eleven UNI CIEP instructors participated in the survey that was available at the Survey Monkey website. The survey was anonymous. The purpose of the survey was to collect data about the grammar instruction in the program and receive feedback regarding grammar from UNI CIEP teachers. The grammar coordinator is planning to use the information obtained from the survey to review grammar instruction in the program, suggest areas of grammar that need development, and recommend changes in the area of grammar. In February of 2011, Tom Riedmiller, an Academic Support Specialist at UNI CIEP, conducted research concerning the use of laptops and other technology equipment throughout the department. The summary of his research and the results of the surveys are listed below.